An emergency room doctor who worked in Poughkeepsie and Elmira stands accused of gross negligence for discharging five patients with severe medical conditions that were in need of immediate attention. This same doctor subject to disciplinary hearings for the misconduct which occurred between 2012 and 2016. However, he attested on applications to other New York hospitals that he was not subject to disciplinary proceedings, thus allegedly committing fraud on his application. According to Ellis Hospital representatives, the hospital never officially hired the doctor and it’s unclear as to whether he ever performed surgery at the hospital. Due to the complexity of emergency room care, emergency room doctors are held to a much lower standard than specialists and general practitioners. Emergency room doctors often have to make split-second decisions and do not have the luxury of running tests or spending time with a patient’s charts. Patients are rushed into the emergency room and the doctor’s job is to stabilize the patient so that they can get further treatment. In addition, some patients show up to the emergency room with seemingly less urgent problems and need to be diagnosed and admitted. In cases where the patient’s condition is dangerous or likely to immediately get worse, in most cases the doctor is expected to admit the patient so that other doctors can diagnose or treat the problem. In this doctor’s case, hospital officials took action against him after he sent home a 7-month-old infant with a severe respiratory infection and a 22-year-old who needed immediate gallbladder surgery. In one instance, the doctor discharged a man who was suffering from heart symptoms. The doctor discharged the patient without further care. As the patient stood up, the man suffered another severe heart attack from which he died. The man’s EKG showed irregularities. The doctor subsequently allegedly lied on applications in order to cover up the numerous medical malpractice cases that had been filed against him and being under investigation for gross misconduct. According to reports, the doctor was licensed in Pennsylvania as a doctor of osteopathy. In 2010, he moved to New York where he began working in emergency rooms. During his six years in New York, he tallied five major medical malpractice lawsuits against him. He is still licensed to practice medicine in Florida. Not only does this doctor face civil suits, but he now faces criminal charges as well. Since he allegedly lied on his applications to Ellis Hospital, he is accused of fraud. If he is found guilty, he will lose his license to practice medicine in New York. He could, however, continue to practice in Florida. The Palmer Law Firm, P.A. 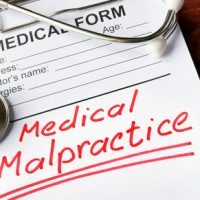 in Tampa helps injured patients recover damages when their doctor is guilty of medical malpractice. Give us a call or talk to us online to set up an appointment. Joseph Lopez achieved a substantial verdict against Hart Bus Line and Hillsborough County in his first jury trial as lead counsel. The verdict far exceeded the sovereign immunity limits for each defendant and was multiple times larger than any offer by either defendant. This was a great result for a very deserving young women after a very hard fought trial. Jennifer Brigman recently completed all florida bar required prerequisites and is now a Florida Registered Paralegal. Jennifer is a favorite among her co-workers and the firms clients. She is extremely hardworking and professional. We are lucky to have her as part of the team. Congrats Jennifer. Martin Palmer was again recognized for his work in the personal injury field by being named to The Best Lawyers in America for 2018. This distinction is a peer nominated and reviewed award appearing in US News and World Report. Mr. Palmer has held this distinction for several years running. © 2017 - 2019 The Palmer Law Firm, P.A. All rights reserved.